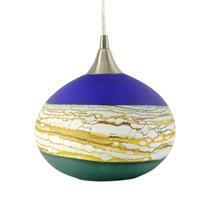 "Medium Strata Sphere" Hand Blown Glass Sculpture, Hand Signed byGartnerBlade Glass. 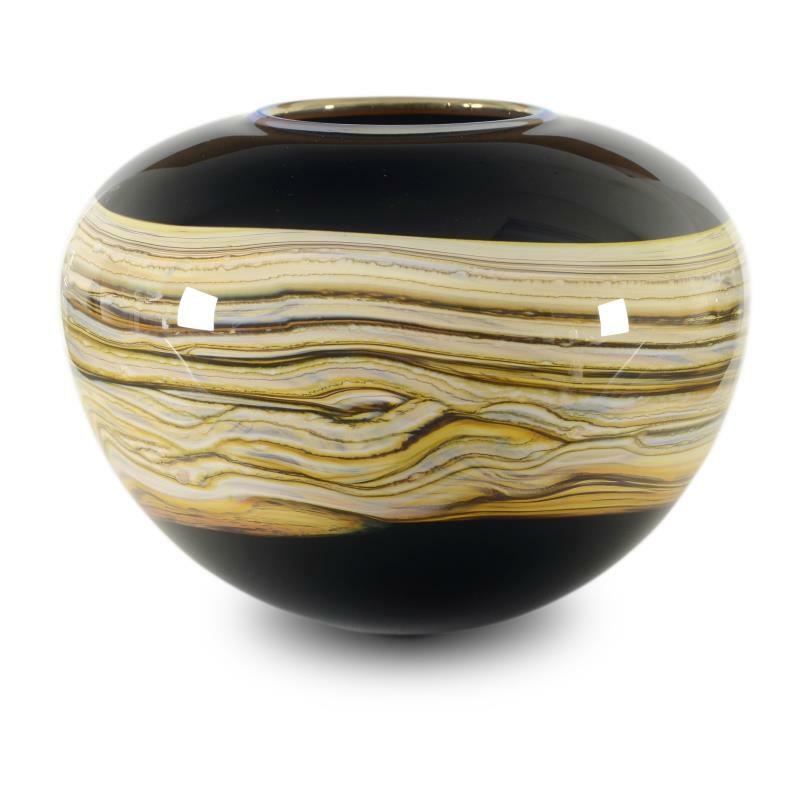 This is a hand blown glass "Medium Strata Sphere" sculpture combines sand-etched exteriors with an elegant gold lip accent and is hand signed by GartnerBlade Glass. Measures approx. 8.5" x 6" x 8.5"; 3 lbs. GartnerBlade Glass, based in Ashley Falls, Massachusetts, was formed by Stephen Gartner and Danielle Blade in 1995. Blade, who hails from England, is the daughter of British glass artist Martin Evans, and Gartner was born in Phoenix, Arizona but grew up in the southern U.S. and Europe. Both artists trained with notable artists in the U.S. and Europe, and had previously worked as production glassblowers and as glass-blowing instructors before starting their own studio. 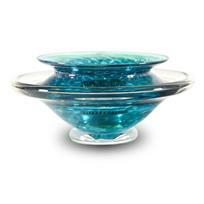 With this business collaboration, Blade and Gartner strive to create a synthesis of individual ideas and techniques to create unique and compelling hand-blown works of art. GartnerBlade often looks to nature for inspiration, mimicking layers of geological strata, ancient fossils, bones, and flora and fauna in breathtakingly beautiful glass pieces. Gartner and Blade have recently begun to engage with the idea of ritual and worship through their work, looking to vessels and objects that are used in ritual and ceremony in contemporary practice and in primitive cultures. "Medium Ikebana Flower Bowl" Hand Blown Glass Sculpture, Hand Signed byGartnerBlade Glass. 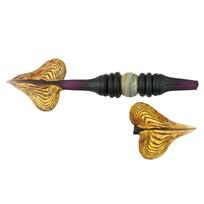 "Austral Sculpture" Hand-Blown Glass Sculpture, Hand Signed by GartnerBlade Glass, with Metal Display Stand. "Small Ikebana Flower Bowl" Hand Blown Glass Sculpture, Hand Signed byGartnerBlade Glass. 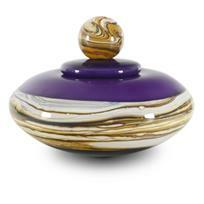 "Amethyst Strata Covered Bowl" Hand Blown Glass Sculpture, Hand Signed byGartnerBlade Glass. 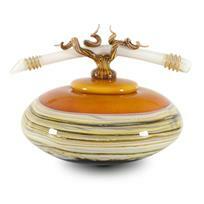 "Small Tangerine Bowl with Bone Finial" Hand Blown Glass Sculpture, Hand Signed byGartnerBlade Glass. 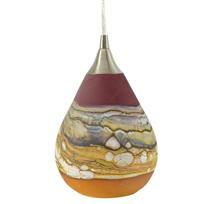 "Small Strata Hanging Lamp" Hand Blown Glass Sculpture, Hand Signed byGartnerBlade Glass. "Medium White Opal Sphere" Hand Blown Glass Sculpture, Hand Signed byGartnerBlade Glass.